When I first starting learning to play guitar, and after the initial absorption of chords, scales, strumming, and the like, the focus was on playing all the classic guitar riffs from the bands of the day. Throw in an electric guitar copy and a cheap practice amp from my folks one birthday and all you could hear from my room was many out-of-tune distorted licks all day long. Eventually, the guitar came into tune (better ears, plus a Boss tuner), the distortion a bit better, but the premise was the same. Learn all the most complicated guitar music note-for-note, rhythm and lead parts both, until I could play along with the recordings with ease. This was not a strategy that I alone cultivated — in my town, this was the standard. Everyone wanted to be the local hotshot guitarist, and those in the mix were practicing many hours daily to make this happen. It was like our local version of the Guitar Olympics. There are a few situations in which these skills really shine, most notably onstage with a band, and with all your own gear. However, more often than not, life is not like that. It might be a friend whose spirits need to be picked up and there’s an acoustic guitar laying around. Or at a house party and people want to hear you play a song alone with a roommate’s beater guitar. Being able to shred every Metallica lick is a valuable skill, but in these situations, knowing, playing, and singing (I’ll get to this) is infinitely better. No one wants to hear the Best Guitar Licks from Metallica — they want to hear a Metallica song. A good musician should be able to play the music that they care about in any situation, any environment, with whatever tools are available. This is where the song comes in. It was written for a reason and is the part with which the listener ultimately connects. When you can replicate as much of that as possible, using whatever means are available, the connection becomes that much stronger. And because the listener’s bond with the song is so strong, more often than not, they’ll forgive your singing if it turns out to be poor, as long as it’s heartfelt. 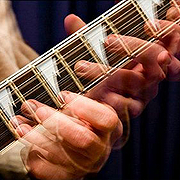 If you can tune a guitar, then you know what “in tune” and “out of tune” sounds like, so you should be able to correct your vocal pitch to the point where you can at least carry the tune. If you can’t, you just haven’t spent enough time doing it. Practice it with as much gusto as your playing and you’ll see the difference. Now, presumably if you’ve learned riffs for various songs, then you know how those songs go. It’s just a matter of remembering the chords, the song structure, and the lyrics. To aid in this, you can look up the chords and melody on tab sites like Ultimate Guitar, or if you want the official stuff, check out any online seller of music songbooks. For me personally, I never knew many complete songs until my daughter was born. When she was one year old, my wife and I could barely get her to eat while sitting in her high chair. However, we eventually found out that if I sang and played guitar while food was in front of her, she’d become absorbed in the music and start to eat without noticing. Thus, playing for her during mealtime became standard practice and I needed to start learning songs in a hurry. So I pulled out my Beatles Complete songbook and started memorizing a new tune daily until enough I had enough repertoire to last a few meals. In the end, it isn’t about being a jukebox or a karaoke machine. It’s simply tapping the love of music shared by yourself you and the listener via your performance. And that’s a very powerful thing. Can you think of a better reason to be learning & playing music?